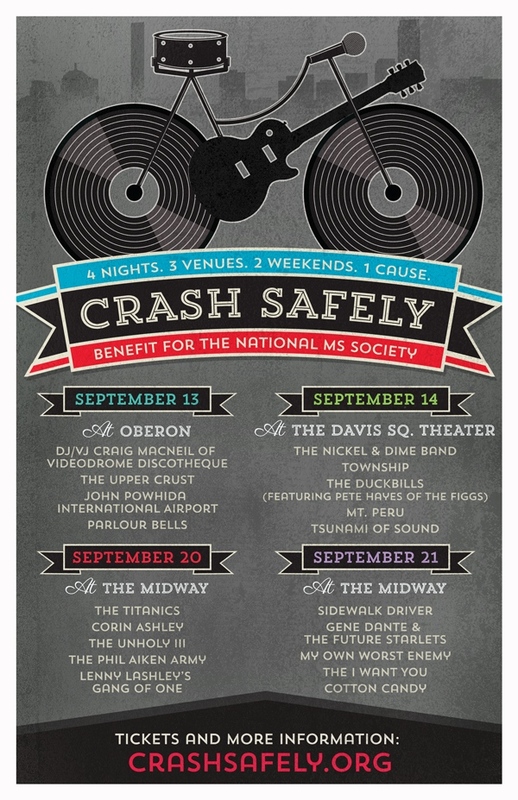 Kicking off tonight - CRASH SAFELY is back with four nights of live music over the next two weeks. The Multiple Sclerosis fundraiser allows locals to play a part in the fight against the debilitating disease while seeing some of the best local music. The Crash Safely event is a labor of love. Crash Safely was created by musician Amanda Nichols, former writer for The Noise, Boston's Weekly Dig, YourFlesh Magazine and Chunklet Magazine, Pete Hayes of The Figgs with support from Nick Blakey, Boston musician and booking agent. Both Nichols and Hayes were diagnosed with MS in 2008 and everyone involved with the project has had their life impacted in some way by the disease - which currently has no cure. The community of support that has formed around Nichols and Hayes - and have helped play a part in the Crash Safely cause - has been inspiring. This is a cause worth caring about!